Vedetta Marie teams up Matt Lassiter creating the "J-Entertainment Duo" known as "50% DANGEROUS". Both members bring unique qualities and content to the team. Vedetta has a extensive background in; dance fitness/choreography (with a otaku twist! ), cosplay crafting and modeling, and Japanese Street Fashion/J-modeling. After a successful launch of her first fashion collection "Vandaline" (50dangerous.com) she now works on her second fashion collection "Gravity". 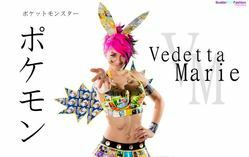 When not at conventions, Vedetta is a fashion designer creating custom ensembles for entertainers ranging from industry guest to Japanese musicians. Along side those, Vedetta works on her convention events, J-Modeling, and unique cosplay creations like her MTG Card Armor Cosplay. Above all else though, Vedetta Marie enjoys interacting with conventions attendees, bringing a host of unique panels ranging from learning about crafting, to high energy dance fun! Vedetta Marie's sole goal is to bring fun and unity to any convention she attends!